The p4ges project is coming to an end. We have already published 10 articles in international journals and presented papers at more than 50 academic conferences and workshops. We have of also shared our results (adapted for the audience) at the regional and local scale. 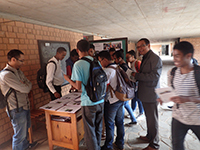 Today we held an academic conference at the Ecole Supérieure des Sciences Agronomiques (ESSA), University of Antananarivo in Madagascar to share our results with the academic community, before a policy-focused event next week. The event was very well attended with standing room only in ESSA’s largest lecture theatre. We had a table loaded with various outputs from the projects including summaries of many of our published papers (in English and French) and the project summary booklet which our guests really appreciated. The event was chaired by Dr Patrick Ranjatson and opened with and introduction to the project from the project lead Prof Julia Jones from Bangor University. Following this, Dr Ramboazanaka Murielle, the Director of research for the University of Antananarivo, Dr Rabemananjara Zo, the head of Water and Forest department and Prof Bruno Ramamonjisoa, Director of the Ecole Supérieure des Sciences Agronomiques each gave a short speech to put the conference in context. Dr Ranjatson explained that we had chosen to focus the event on three branches of our research in detail rather than trying to cover everything. However he pointed people to the summaries of our papers for more information. This was followed by a presentation by Alexandra Rasoamanana (ESSA) looking at ‘Who bears the cost of forest conservation in Madagascar?’ which was a detailed economic analysis of the magnitude and distribution of opportunity costs of conservation and the magnitude and distribution of compensation under the World Bank social safeguard system. Finally, Tokihenintsoa Andrianjohaninarivo (CI) continued with the social theme, with an excellent presentation ‘Can small scale livelihood projects help contribute to both sustainable development and forest conservation outcomes?’ This looked at local perceptions of the range of micro-development projects which have been implements around the CAZ corridor in the context of conservation and the REDD+ pilot project and discussed their role in delivering livelihood benefits and in reducing deforestation. The talks were followed by a very lively discussion session with questions from researchers from many institutions. The debates continued over an open air reception on the lawn of the Ecole Supérieure des Science Agronomiques.